This Nativity scene contains Joseph, Mary, baby Jesus, three shepherds with sheep, and three wise men. The scene was carved by Mirirai Chengerai, a legally blind 42-year-old Shona sculptor from Harare, Zimbabwe. The Shona tribe of Zimbabwe is famous for their stone sculptures, but they also have a rich artistic heritage in woodcarvings. 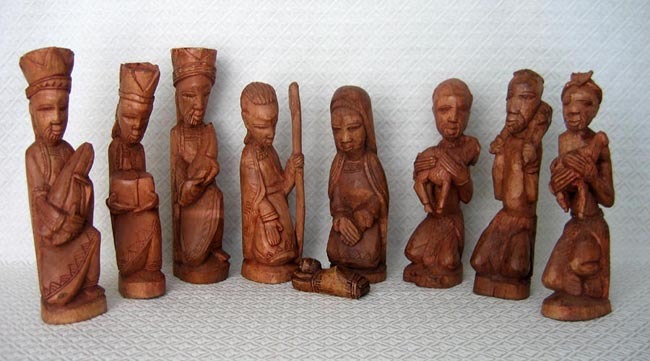 Despite his impaired vision, Mirirai produced a detailed Africanized version of the Christian icon. Each figure in Mirirai's Nativity wears traditional Shona dress. The wood is light jacaranda wood that has been stained dark brown. The tallest piece measures 11.5 inches tall.